The first day of Coachella 2019 is officially on the books and the festival-to-top-all-festivals has flexed its strong arm once again this year. From top-tier production in HP’s Antarctic Dome and the world’s first augmented reality festival stage in the Sahara tent, the festival continually raises the bar. That’s not even making mention of the festival’s expertly-planned operational logistics—with its pristinely clean grounds that make for picture-perfect Instagram moments against Coachella’s iconic ferris wheel, the distant mountains, and desert palms at sunset. It’s hard to remember one is deep inside the world’s most corporatized festival when they’re immersed in the Hollywood-esque magic of Indio Valley. Add to that the debut of Childish Gambino’s Guava Island and RÜFÜS DU SOL’s Underwater, and Coachella may as well add the title “film festival” to its tagline. That’s all without even one mention of the music. With crowd-pleasing favorites like Kasey Musgraves, Anderson .Paak & The Free Nationals, and Diplo, just to name a few, Coachella’s curation from day one offered so many highlights reels that it’s enough to make anyone at home squirm. As we gear up for the night two live stream, it’s important to re-cap the magic of the first night. Here are the key moments of day one at Coachella 2019. The biggest star of Coachella’s first night was headliner Childish Gambino, who made several appearances during day one. Before he took the Coachella main stage, the actor/rapper, also known as Donald Glover debuted his film, Guava Island, with Rihanna, which started streaming on Amazon at midnight last week. 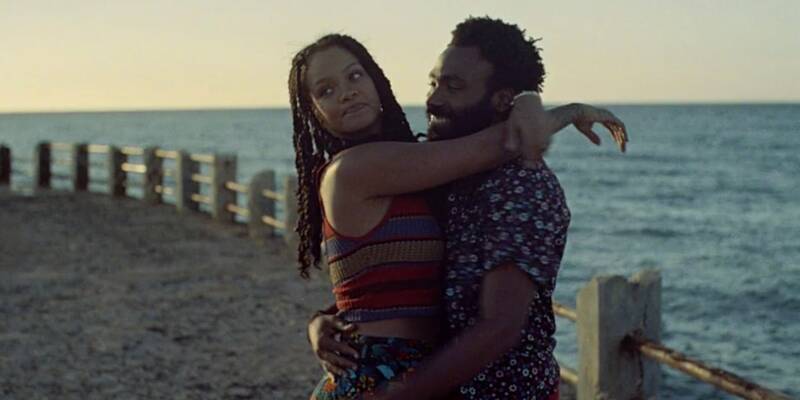 The film follows Glover as Deni, a singer hoping to bring the mystical island of Guava together with a music festival, alongside his girlfriend Kofi, played by Rihanna. Under his Childish Gambino alias, Glover also admonished people in the crowd for recording on their phones early in the set, rather than being present with the music. “We really need to feel each other… this is not a concert, this is church.” Gambino stated, relaying his concert rules. Then he took the crowd to church with fan favorites like “Summertime Magic,” “Have Some Love”, and “Boogie Man.” Gambino’s usage of an all-black choir made his performance all the more powerful, bringing an added layer of spirituality to his set. Jaden Smith’s Coachella debut was a full-on family affair with sister, Willow Smith, opening the set hanging from a suspension wire, as well as their mom, Jada Pinkett Smith, in attendance. Also showing out their support in the crowd were friends Kendall Jenner and Haley Bieber, two of the high-profile models caught up in the Fyre Fraud scandal. Kendall and Kylie Jenner dancing with Jaden and Willow Smith at Coachella, Empire Polo Club, Indio, California, Friday, April 12, 2019. However, fans watching on the “Couchella” live stream blasted Smith’s use of autotune during not just one song, but throughout his entire set. Oh, and in typical Coachella commercial fashion, Jaden Smith “sang” perched atop a model X Tesla suspended in midair. DJ Snake performs at Coachella Valley Music & Arts Festival, 2017. During his set on the Outdoor stage, DJ Snake pulled not one, not two, but three surprise tricks out of his magic hat. When the French producer began playing the Spanish hit, “Te Bote,” reggaeton rapper Ozuna walked out onto the stage to everyone’s delight. But that’s not all DJ Snake had in store for the crowd. DJ Snake brings out Ozuna, Cardi B, and Selena Gomez during his Coachella performance, Friday, April 12, 2019. Photo courtesy of The Desert Sun. During the song “Taki Taki,” fellow Coachella alum Cardi B appeared on stage to rap her verse alongside the two fellows. Just when the crowd thought the special guest appearances were over, singer/actress Selena Gomez emerged to sing the outro of the song. Then, in a moment of finality, the posse took a selfie on stage with a special shoutout to the Latinos in the crowd. BLACKPINK made their highly-anticipated US festival debut yesterday evening, taking Coachella’s Sahara stage at 8pm. YouTube even broadcasted the set live from Coachella on the iconic Times Square big screen. The crowd spilled out of the stage’s limits, reportedly stretching as far as some nearby food vendors, proving the demand for K-pop in the States. The South Korean four-piece outfit are already megastars throughout Asia with a musical catalogue that fuses hip-hop, EDM, synth ballads, and even heavy rock. The performance drew a mix of mind-shattered fans, who reported attending Coachella specifically for BLACKPINK, along with plenty of curious onlookers who would have never seen a K-pop show otherwise. Rosé even invited fans to sing along despite that it “might be hard because some of [the words] are in Korean.” What was most impressive was BLACKPINK’s onstage rapport, which hit a sweet spot between K-pop’s cheery, futurist sheen and hip-hop’s bravado and prowess. Jennie, Rose, Lisa and Jisoo became the first K-pop girl group to play Coachella when they took the stage at the festival in Indio, California, on Friday. The group went on to deliver the full canon of K-pop crossovers, but the girls also aware of what the night means for K-pop on the whole. “We’re from totally different worlds,” said Rosé, referencing the stark cultural contrasts between the US and South Korea. “But we’ve learned so deeply tonight that music brings us together as one.” All in all, BLACKPINK’s performance was electrifying and statement-making in the sense that they’re only just getting started. When Australian electronic trio RÜFÜS DU SOL announced they’d be premiering their first foray into filmmaking at Coachella, it added another layer of excitement for attendees. Now put that film on HP’s 11,000-square foot projection dome, the biggest in the world, and you’ve got a recipe for full-on immersive audio-visual spectacle. For the third year in a row, HP brought its massive Antarctic Dome to Indio Valley, giving Coachella attendees an air-conditioned escape with mind-bending entertainment. This year, that entertainment came in the form of a music video for RÜFÜS DU SOL’s hit single “Underwater,” while the group played live. The 360-experience will play about every 15 minutes throughout both Coachella weekends. So. The immersive, 360 video for @rufusdusol's "Underwater" at the @hp Antarctic Dome @coachella is definitely the trippiest thing I've yet witnessed. These are clips of the guys' DJ set after a panel I moderated last night. I'm 100 percent going back to see this again, hahahaha. Who's coming with me?! S/O director James Frost and the five amazing visual artists who put this together.